As well as training expert researchers in integrated Asian Studies, KUASU operates a series of curricular subjects under the title of “Studying Japan and Asia in Kyoto.” Offered across the whole university, including in science and engineering faculties, these subjects cover a broad base of knowledge on the societies and cultures of Japan and the Asian region. For international students at Kyoto University, the subjects are an opportunity for organized disciplinary study that enriches knowledge of Japanese society through comparison with other parts of Asia. For Japanese students (including SEND Program outbound students), the subjects furnish a disciplinary basis through which to “re-discover” their own country and develop the ability to communicate ideas about Japan and Asia to people all over the world. Kyoto University also has an extensive menu of classes taught in an English medium as well as subjects in many other languages, including those of the Asian region. These are offered to both long- and short-term international students, and by the general student population. 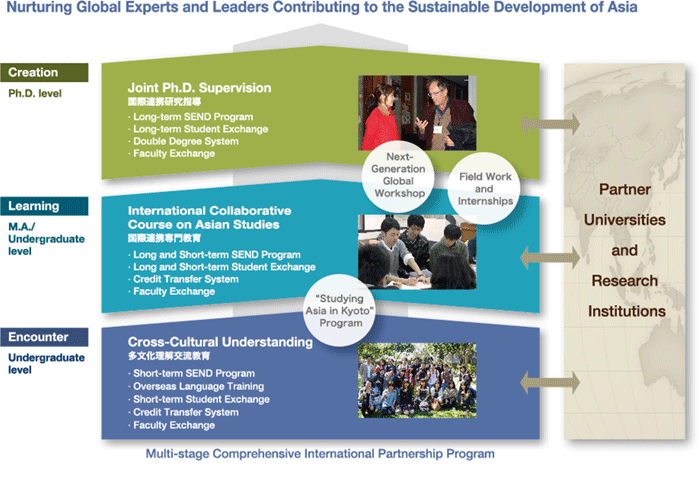 The Kyoto University Asian Studies Unit coordinates a diverse range of overseas programs, including overseas language training, short-term SEND programs, overseas field work, internships, and long-term SEND programs. The Unit is also responsible for short- and long-term inbound student programs. This Program is supported by the MEXT Re-Inventing Japan Project “Rediscovering Japan through Collaboration in the Open ASEAN+6 － International Human Resource Development Centering on the SEND Program”. SEND (Student Exchange – Nippon Discovery) is a program which aims to nurture the expert human resources who will be a bridge between Japan and other regions of the world, particularly the ASEAN region. The Japanese students who are sent to those regions study local languages and cultures while at the same time supporting Japanese language education and teaching local students about Japan.